Untreated high blood pressure is one of the most common causes of kidney failure. And kidney disease can also cause high blood pressure. High blood pressure is also called hypertension. As blood moves through your body it pushes against the sides of your blood vessels. Blood pressure is the force of your blood against the walls of your blood vessels. High blood pressure damages the walls of your blood vessels. There are a lot of tiny blood vessels in your kidneys, and untreated high blood pressure makes them narrow and harden. As a result, your kidneys become less able to remove waste and extra fluid. The extra fluid then increases your blood pressure even further, adding to the problem. Your kidneys also produce a hormone that controls blood pressure. When they are not working well they can't do that properly. Blood pressure is given as two numbers. The top number, called the systolic pressure, is the pressure when your heart is pushing the blood out around your body. It is the higher number. The bottom number, called the diastolic pressure, is the pressure when your heart is resting between beats. It is the lower number. You have high blood pressure if the top number (systolic pressure) is 140 or higher and the bottom number (diastolic pressure) is 90 or higher. have a family history of high blood pressure (it often runs in families). certain medicines, such as birth control pills, nonsteroidal anti-inflammatory drugs (NSAIDs), and recreational drugs such as cocaine and amphetamines. 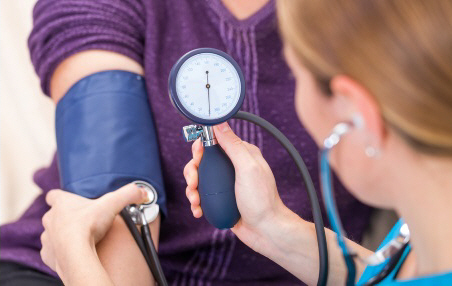 Most people don't know they have high blood pressure, unless they have it measured. However, if your blood pressure is very high you may get symptoms such as headaches, blurred or double vision, or nosebleeds. If you have untreated high blood pressure for a long time, your kidneys can eventually fail.